Whenever I present some data from more recent waves of the CCES or GSS, I consistently get asked the same question: Do you think that evangelicals are eventually going to moderate? The logic of the question is usually based on a perceived embarrassment or regret for electing Donald Trump as president. I am very careful about projecting into the future, especially after the 2016 presidential election. I was trained to stick close to the data and not to make huge extrapolations from what the data shows. However, now I have some data that can help answer some of those questions. Data for Progress has just released the raw data from their survey that was conducted in November of 2018. That’s unbelievably nice of them. This is the first publicly available dataset from the most recent election cycle. Other surveys such as the CCES and GSS will be released in the next six months, but this data gives us an invaluable peek into what happened in 2018. Just a few caveats, however. This survey did not ask the full range of religious tradition variables that appear in the CCES or GSS. Therefore, I have to resort to using those who identify as born-again Protestants. Fortunately, recent research has confirmed that there is a great deal of overlap between using the RELTRAD and self-identification strategy. Also, the sample size is really good (~3,200), but I am spoiled by the massive sample of the CCES (~65,000). So, the confidence intervals will be larger here and statistical uncertainty is an issue. So, it’s best to start at the start. Were white evangelicals less likely to vote for Republicans in 2018? The graph below displays the results from the last two presidential elections from the CCES as well as the new Data for Progress results. Luckily both surveys use the same categories for church attendance making this a true one-to-one comparison. The best way to describe these results is politics as usual. There is no meaningful change to report: white evangelicals are Republicans. There is no significant difference in how white evangelicals who go to church frequently voted between 2012 and 2018. There was no apparent regret in their vote choice after Trump, at least among the most religiously active evangelicals. There could be a case made that less committed evangelicals did turn away from the GOP somewhat in 2018, however given the smaller sample size I wouldn’t place a great deal of stock in that finding until it’s corroborated by other survey data. Let’s look at this from another angle. While vote choice is a fairly blunt instrument, a party identification question gives respondents seven response options, so it seems possible that some evangelicals could have backed away from Trump by going from a “strong Republican” to a “moderate Republican” for instance. The line graph below displays the mean response to the party identification question from 2012 until 2018. The shaded areas around the lines indicate 84% confidence intervals – comparing any two constitutes a 95% t-test. So, did we see white evangelicals moving toward the middle of the political spectrum in 2018? Clearly no. In fact, for five of the six attendance levels white evangelicals were stronger Republicans in 2018 than they were in any of the four previous waves. Obviously, there is more statistical uncertainty for the 2018 sample, but these results indicate that white evangelicals who attended weekly+ were actually more Republican than the same group in 2016. Let me repeat this so it hits home: White evangelicals are more Republican now than they were two years ago. It has become clear that we cannot assume the connection between political orientations and support for Trump among evangelicals, so approval is another important dimension of inquiry. The Data for Progress survey asked respondents “Do you approve or disapprove of the way Donald Trump is handling his job as President?” The heatmap below visualizes how white born-again Protestants responded to this question based on their level of church attendance. The results from their prior two graphs carry over in this one in a clear way. 85% of white born-again Protestants who attend church more than once a week approve of the way Trump is doing his job. That percentage only drops to 77% among those who attend once a week. In fact, even if you go all the way down to those white evangelicals who attend church seldomly, over two thirds still think that Trump is doing a good job. It’s also noteworthy that for the never attending category, 38.1% strongly approve of the job Trump is doing while 42.9% strong disapprove of his job performance. One of the nice things about Data for Progress is that they asked questions that I have never seen before in other surveys. One that really jumped out to me was a battery of questions that asked respondents to express how favorable they felt to a variety of groups ranging from political figures to social movements. I think that the list of groups is timely and interesting. I broke the sample down into three groups: white born-again Protestants, white non born-again Protestants, and non-white born-again Protestants. That should help us understand (in some small way) if it’s race or religion that is driving these favorability views. The results are displayed above with 84% confidence intervals. It’s clear that white born-again Protestants operate in their own world. For all ten groups, their mean scores are way off by themselves compared to the two other groups. Note that Trump received the highest level of favorability, with the Republican Party a distant second. The group(s) that they disliked the most were Democrats, Black Lives Matter, and the Affordable Care Act. The other two groups share favorability views several times. For instance, their views are exactly alike for Labor Unions and the #MeToo movement. The same could be said for Mitch McConnell. However, non-white born-again Protestants seem to have a more favorable view toward typically liberal issues like Black Lives Matter and the ACA than white non-evangelicals. This is the first data that I have gotten my hands on related to evangelicals’ political opinions and vote choice in 2018. When I showed these results to Djupe I think that his reaction is telling: “white evangelicals are off in their own world.” While other racial and religious groups have nuanced and often moderate opinions in 2018, white evangelicals are Republicans through and through. Almost all of them approve of Trump’s job performance, almost all of them voted for Republicans in 2018, and almost all of them have a more favorable view of Donald Trump than they do of any other group. It’s clear that 2018 wasn’t a reckoning for this group, it was a triple-down. I don’t see any hope here of polarization abating in any meaningful way. I wish I had better news. Previous Are There Pro-Life Atheists? Or Pro-Life Liberals? Next New Oxford Research Encyclopedia Articles Up! Can you post the numbers for the relative size of the White Born-Again Protestants who never attend church? That cohort presents such a stark contrast. If it’s growing, it might suggest a process of disaffection in which political opinion (perhaps re: Trump in particular) is inducing moderates/liberals to drop out of, or break fellowship with, their congregations, but without revising their self-ascribed religious identity. All together, i don’t really send any sort of significant changes at any attendance level. 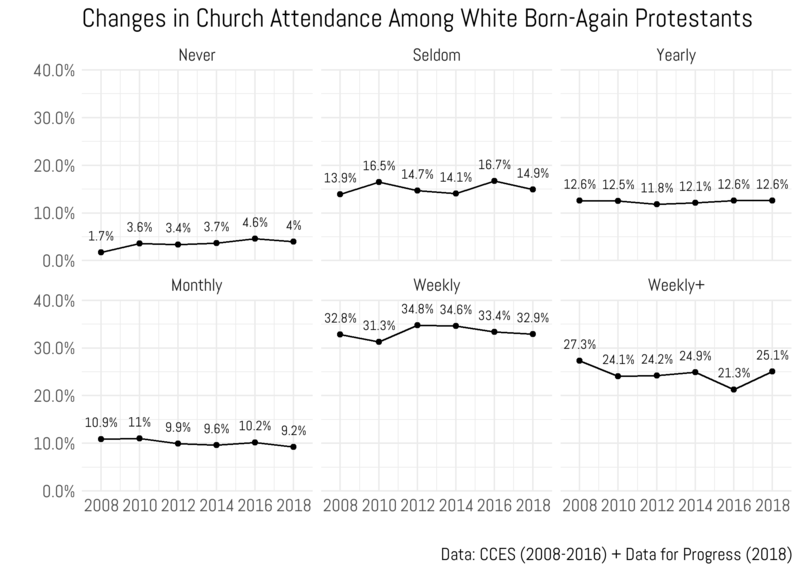 There are some one year blips, but overall the never attending white born-again Protestants are the same today as they were in 2010. So, no Trump backlash in this data. Thanks for running the data on that. Viewed one way, the cohort more than doubled in size, but it was so small to begin with that we’re only talking about a little over 2%. Still amounts to a couple of million individuals, perhaps, but as you say, Evangelical defections over the movement’s political affiliation and/or Trump doesn’t appear to be a major trend. Thanks again.